Lucille R. Vahradian, age 82, formerly of Kenosha, passed away peacefully at her home on 9th Avenue in Grafton, WI early Tuesday, August 19, 2014. She was born on April 28, 1932, daughter of Herman and Agnes Lehr Cook. Growing up on the family farm she learned the love of the outdoors and the value of family. After graduating from South Milwaukee High School she started work as a stenographer. On June 20, 1953, Lucille married Haig Vahradian of Carrollville. Over the years they raised their family and later Lucille worked for the University of Wisconsin – Parkside. She worked for over 20 years, where she provided clerical and office support for the staff and students, retiring in 1993. 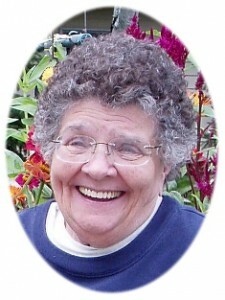 Lucille will be remembered for her love of family, cooking and gardening. In early years, her family often spent time picnicking with her sisters and their families and camping vacations throughout Wisconsin, Yellowstone, Smoky Mountains and Canada. In later years, good times were spent at Sawyer Lake. At family gatherings she was quick to shuffle the cards for a game of sheepshead insisting that everyone down to the last grandchild learn the game. Memories fill the family with joy. She also enjoyed sports – from activities in her youth, to swimming, water skiing and cross-country skiing in her later years. Her continuous support at sporting events for her children and grandchildren will never be forgotten. Always a sports fan, she was often knitting up a storm during Packer games. She is survived by her husband Haig, who resides at Heritage Health and Rehabilitation Center in Port Washington; her three children Buzz H. (Marcia) Vahradian of Wautoma, Rick (Lisa) Vahradian of Pardeeville and Dee (Jim) Jushka of the Town of Port Washington; four grandchildren Chad Rick Vahradian, Kaila Rose Vahradian, Lars Vahradian Erlandson (Elizabeth Paape) and Molly Ann Erlandson (fiancée, Dustin Kesner); two great-grandchildren Abby and Troy Erlandson; two sisters Dorothy (the late John) Takach of Oak Creek and Helen “Joyce” (Joseph) Radocay of Watertown, nieces, nephews, other relatives and friends. Family and friends are invited to a celebration of life (potluck picnic) at noon, Sunday, September 14, 2014 at the Lions Pavilion in the Upper Lake Park in Port Washington. Thanks Carrie, Lucille enjoyed working with you and your mother. She never forgot her union roots. I saw Lucille’s obituary in the Kenosha News this morning, Sunday, Aug 24, 2014 and was saddened by this news. My mother, Virginia Peters and I worked with Lucille for many years at UW-Parkside. She was also very involved in AFSME, Local 2180, the union at UW-Parkside. My mother always considered Lucille a good friend. I, like my mother, always enjoyed Lucille’s stories about her family. She was a good cook and would share her receipes with us. She was always willing to help someone else and would always look for the good in people. I have thought about her often in the last fews years with the decline of my mother. I am sure that her family will greatly miss her as she was a great human being. My mother was a difficult person to get along with, but Lucille considered my mother a friend. Lucille once told me that “you have to like people in spite of their faults, not disliking them because of their faults.” I will take comfort in the fact that my mother will have a true friend in heaven. Devasting and sad news. Anna, Lucille’s “Sister”, was visually shaken. Anna’s words from her heart: “I loved her very much. She was the best. I will miss her. It’s so, so sad”. mother in-law, Arsioug Vahradian and from Anna too! Proudly she shared them with succeeding family generations. Haig, you know this; as we all do-we had been Blessed with her in our lives! There are many recipes; of another sort, I learned from my Godmother Lucille. These were pearls of wisdom that touch the heart. I incorporate them whenever possible. Her genuine smile and good humor will be long remembered. Dear Haig, Buzz, Rick and Dee-Thanks for sharing your beloved wife and dear mother with us. She added a lot of flavor to our life. We pray God grant Lucille’s soul eternal comfort and peace. Our sincerest condolences for your loss. Although we will never see her in this life again, we have a lifetime’s worth of wonderful memories to cherish. My favorite aunt and uncle will always remain within us. Be strong and have faith – we will all see her again in God’s Kingdom.